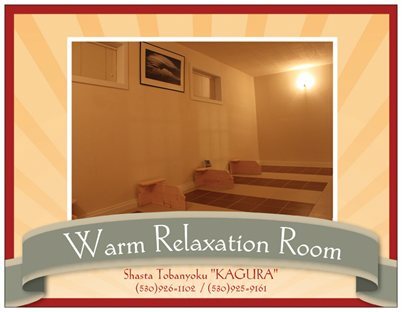 TOBANYOKU is a heated, environmentally controlled relaxation room. the room temperature is kept at 110 degrees, and 20% of humidity. cells will be revitalized, toxins expunged, and the mind and body’s balance can be well maintained. The study shows that the stress level decrease by 30 minutes of use. which is not purpose of TOBANYOKU. The purpose of TOBANYOKU is to relax and not to sweat. that reduce harmful chemical/toxic substances in the air. it is very gentle environment for babies and elderly people.